Isn't it interesting how we get unusual cravings for culinary tidbits out of the blue? Last week I found myself struck with an extraordinary craving for Green Tea ice cream. I know, how odd is that. Since being diagnosed with MS, I am on a very strict diet which precludes dairy from my life. But, as my father used to say, there's more than one way to skin a cat:) I placed an order on Amazon for Matcha--the finely ground green tea powder, and began searching for recipes. After some online searching for recipes, with a little tinkering I was delighted to end up with a smoothie composed of Matcha green tea powder, raw honey, cashew milk, coconut oil, and frozen cubes of mango. I've now made this three days in a row and think I'll have more tomorrow. As I embrace the AIP (auto-immune protocol) I'm having to give up nuts, too, so will make it with coconut milk instead. Some days ago these green pearls reminded me of green tea ice cream, possibly the originator of my craving. To be worn at full length or doubled, 35 inches of cultured pearls, Swarovski crystals, and antiqued silver wire with a few floral bead caps will get you in the Matcha mood:) Necklace $51, Earrings $14 (shown here on 1.5" kidney wires, but these can be switched out). 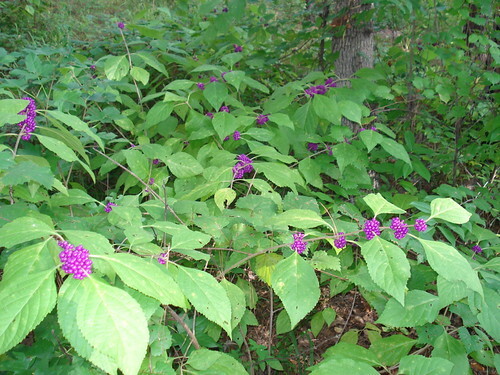 The American Beautyberry or Callicarpa americana. I found this while looking for magenta purple flowers online. It blooms in Texas in late summer/autumn. The berries are edible and contain a natural mosquito repellant, to boot. I wire wrapped these purple coral beads with soft gray 10mm freshwater pearls, Swarovski crystals and antiqued silver hammered links. Wire used in antiqued silver parawire. Necklace measures 34 inches. Earrings measure 2 inches. Right now, this is my only American Beautyberry necklace, but I might be able to procure more coral beads at our local store. These just came out a few weeks ago. I had never seen purple coral before and knew my purple-loving friends would definitely want to see them made into a Magpie:) See on Etsy here!